Pressure control: they switch off when the set point is reached and when pressure goes below the pressure hysteresis value (also named differential), they automatically switch on again. Most of products are UL(file E246956) and they use UL,CSA,CE, VDE, ENEC approved microswitches in standard. The same model can be used anywhere in the world. Self-locking stainless steel or common plastic nuts, tubing, hose securing nut, adhesive gaskets, housing. Most products designed to receive 2 membranes to comply with class II insulation requests in Europe. 50 years OEM components experience: trained manufacturing organization: we made our first pressure switch in 1945. PC board types, snap action switches for high voltage and ratings or slow make and break contact for electronic application, silver, gold or copper contacts, 1 switch, 2 switches, 3 switches, 1 or 2 membranes and plenty of pressure connection fittings. An air switch is a wireless control used as an electrically safe remote control to operate motors or pumps or electrical devices. This is a shockproof, explosion proof and waterproof system. The system works on a sealed air displacement principle. It uses an air bellows actuator (air button, foot pedal) joined by tubing to an air switch contained within the equipment or appliance to be switched. 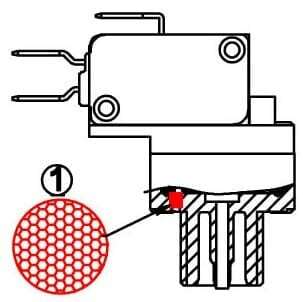 As the transmitter button is depressed and released, sealed air is displaced and transmitted through an air hose connected to a pressure sensitive switch, switching the equipment on. 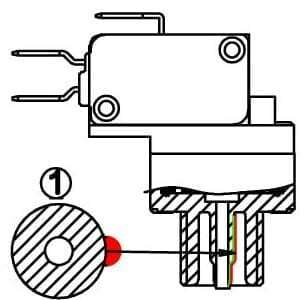 Air switches have integrated compensation system (usually a small calibrated leak named bleed hole) to avoid an erratic operation due to internal air volume pressure difference with the ambiance when temperature or barometric pressure changes. Most common applications are in swimming – pools, spas and hot tubs, showers, saunas, plumbing tools, sink erasers, garbage disposals. They switch motors, pumps, lights, blowers or pc board loads. Latching (or bistable): The circuit remains energized until the air transmitter is depressed and released again, switching the equipment off. Non-latching (or momentary): The circuit is energized when the air transmitter is pressed. When the air transmitter is released, it switches off. Air switches eliminate spurious switching signals and electrical interferences which can be picked up by cables used on low voltage circuits. Air switches are the most economical solution for short distance remote control. 1. Select action (latching or non-latching). 3. Select sensitivity: the maximum operating distance is linked to length of PVC tubing between air switch and air button, volume of air button. Avoid small volume air button and long tubing. Sensitivity decreases when rating increases. A high rating air switch can only be used with short distance tubing.